Pasternack pin-pin limiter PE8021 is part of our extensive in-stock RF, microwave and millimeter wave components available for purchase. 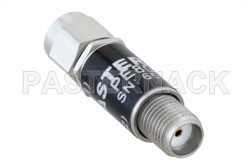 This pin-pin limiter is manufactured with SMA male to SMA female connectors and is 50 Ohm. Our pin-pin SMA limiter has a minimum frequency of 2 GHz and a maximum frequency of 8 GHz. This SMA coaxial RF limiter has a maximum insertion loss of dB and a maximum VSWR of . 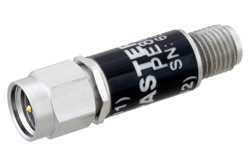 PE8021 coaxial SMA limiter is one of over 40,000 RF, microwave and millimeter wave components supplied by Pasternack. Our SMA pin-pin limiter can be bought and shipped worldwide the same-day as with other Pasternack in-stock RF parts.